The gearbox had always jumped out of second, so needed an overhaul. Also the car never had overdrive fitted, something I had always desired. I did have a spare overdrive gearbox which I obtained in around 1982 when a friend and I broke up a GT6 Mk3 for spares. I also had another gearbox, which I had forgotten I had, so including one in the car I had three old gearboxes! The overdrive was the Laycock de Normanville D type, which was a normal fitment on all overdrive GT6s. 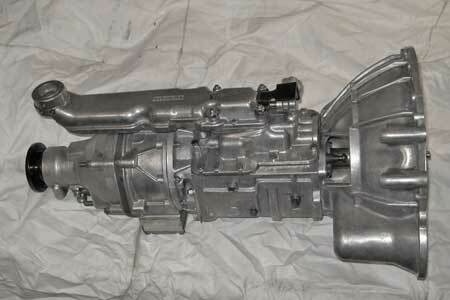 "Here on offer is one of my spare ultimate spec Competition Gearboxes. This Unit is built with one of the limited edition Alloy Gear cases. The Gear set is a new 1850 single rail type with the 23 x 1" input shaft. The main shaft is a new specially produced big tip 3 rail item as is the new 60 Rockwell Lay shaft. The Lay gear has been sleeved for extra strength. The Bearings are the best Quality Brands Input NSK ( Now owners of RHP ) & SKF. All syncro cones are all individually selected for fit & grip. Only best factory originals are used & not weakened by skimming. The hubs are chosen from a large selection for quality & fit to the main shaft used & are the forged centre type that do not wear. All tolerances are set to the minimum to make a tight slick unit capable of high mileage in a powerful Grand Tourer or Track car. The very low mileage Dolomite Sprint J Type overdrive unit incorporates the late stronger centre case (see pics) which is reinforced & has improved operating pistons with new seals, uprated cone clutch linings, new bearings & seals throughout. This unit is set with slightly higher pressure for track use and high power output 180 BHP +. I can re set this for purely road use & milder tune engines to engage with less vigour for the winning bidder if required. The ratio of the overdrive is the standard 25% although the 28% ratio is one I use for powerful Grand Tourers. This could be an optional extra for the winning bidder. This unit had been tested for a limited time on the road only & is faultless in all functions. I have stripped & checked the gearbox & had to make only minor thrust washer adjustments. A very uncommon super lightweight sports/competition unit ready to fit with bell housing, remote & new overdrive isolator switch. Built to the highest standards with the finest parts available". ●	Lightweight aluminium alloy main case (from Canleys) - this required additional machining. ●	Special Lay cluster with longer roller on rear end. ●	18mm tip main shaft. ●	0.200" 2nd gear thrust washer and High flow oil bush pack. ●	1850 saloon 1st motion shaft with fine spline (23 splines). ●	Attached to fully rebuilt J type Laycock de Normanville Overdrive, ratio to be maintained at 25%. ●	All bearings are good quality RHP branded ones. Mike says that "the term 18mm refers to the size of the tip size of main shafts the original size was 0.500" this failed on most boxes as to small so when the 1500 single rail box was introduced BL/Triumph introduced it along with thicker thrust washer 0.200" under 2nd gear, as for the high flow oil bush pack this was also introduced at the same time as some box's were seizing up 147354 is the No on Rimmers site I think, all this goes to making full heavy duty box". The Canley Classics lightweight aluminium alloy case is based on the latest generation (and strongest) 3 rail gearbox. Major benefits include superior heat transfer properties and that significant reduction in weight to compensate for the heavier long throw crank of the 2.5L engine. 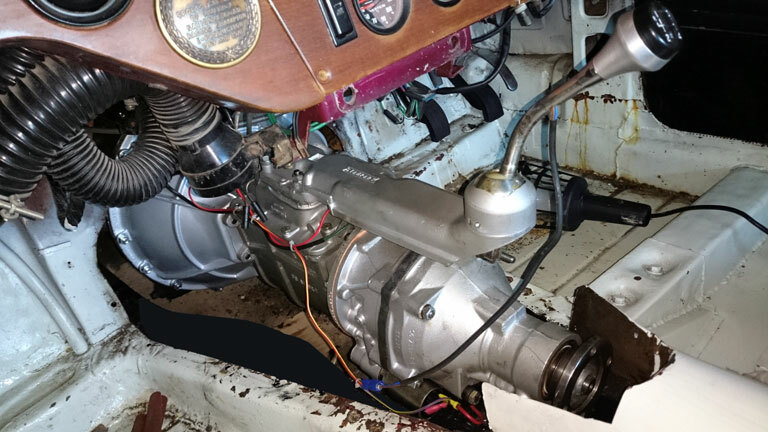 The pictures below of the gearbox and overdrive build were supplied by Mike, the GT6 Mk3 gearlever are by the author. Below, the 'new' gearbox/overdrive prior to installation; and the unit fitted in the car, with new fasteners throughout. Note the cutout transmission tunnel to take the longer gearbox/overdrive unit. A cover for this will come from a scrapped Mk3. Note the propshaft is not yet fitted, but the new one supplied by Mike fitted perfectly!